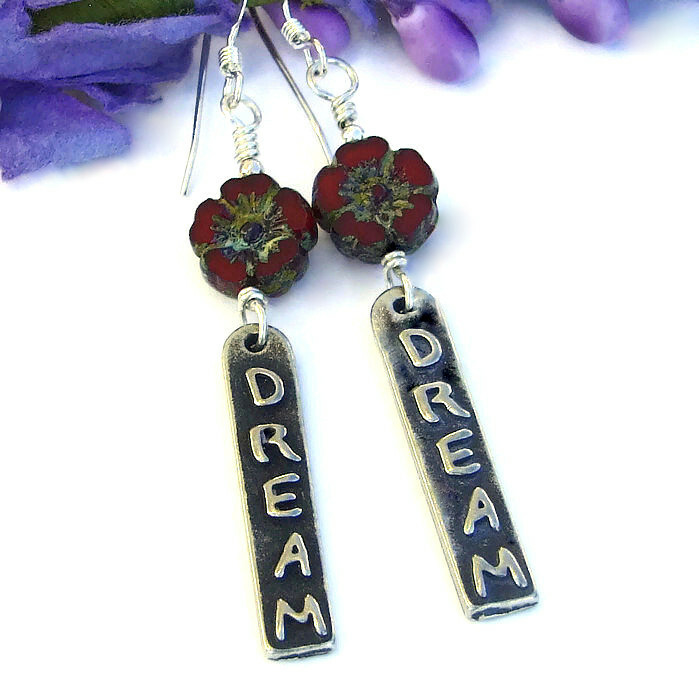 What a delightful pair of handmade earrings for the dreamer in your life! 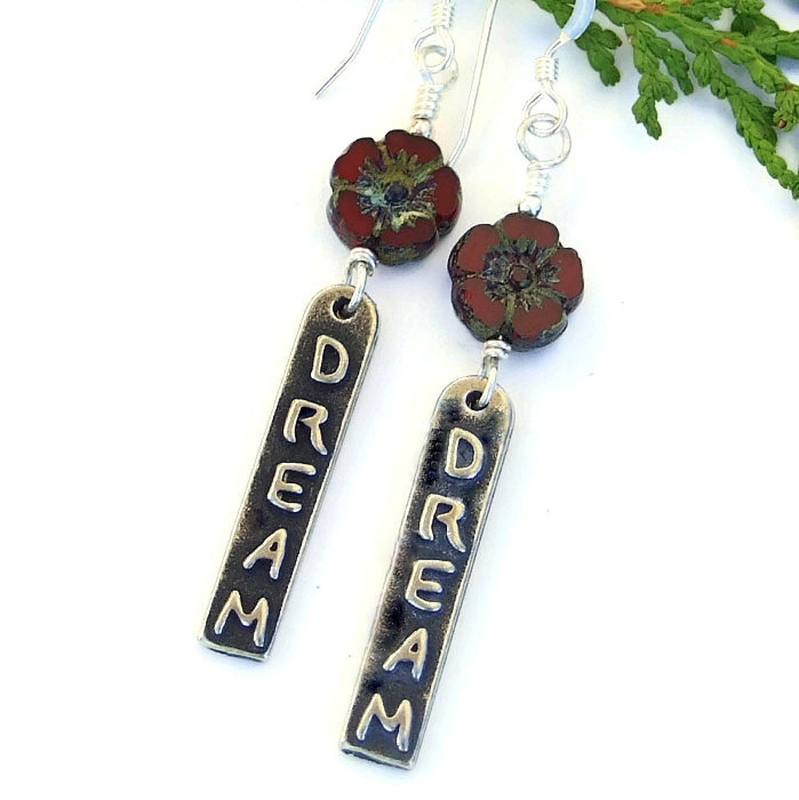 Simple in design but carrying a lovely message, the one of a kind DREAM earrings feature a linear pewter charm with the inspirational word “dream” in raised letters. 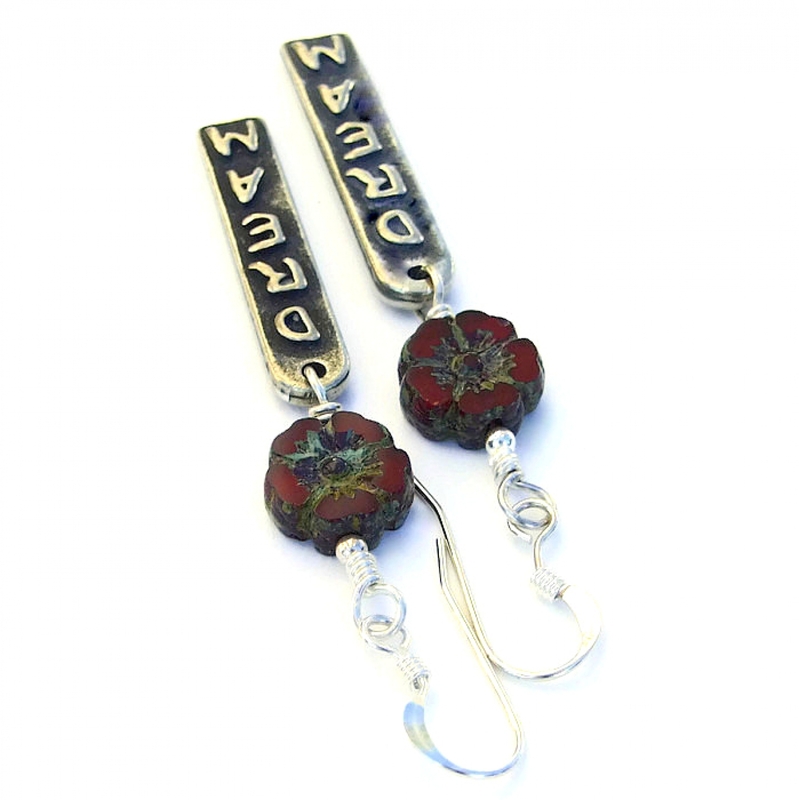 The charm hangs below a deep red, Czech glass flower bead with a Picasso finish to bring out the amazing floral detail. 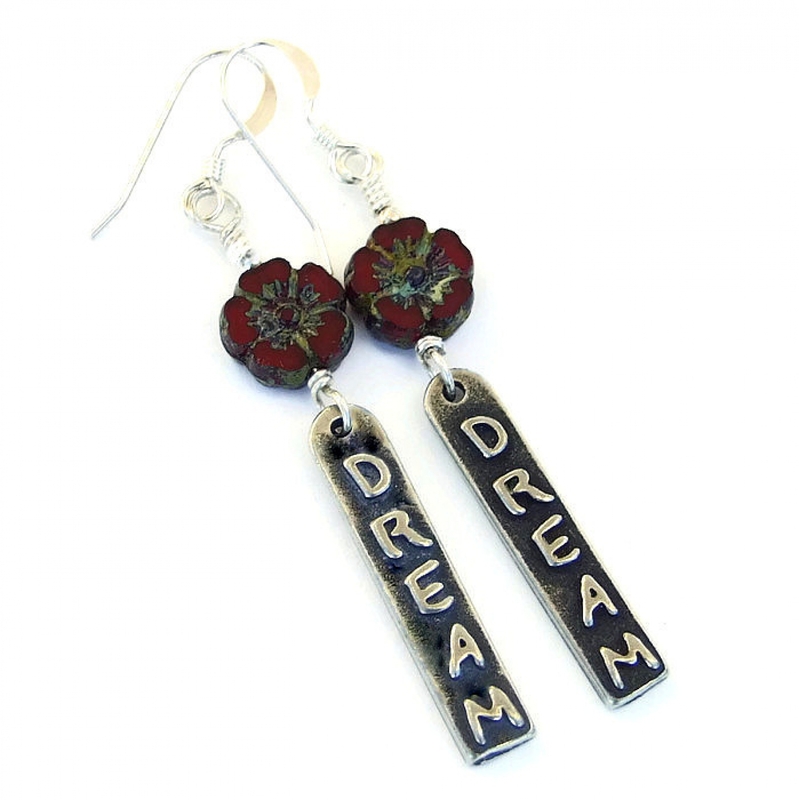 Created for the woman who lives her life with more than a bit of boho flair and loves artisan jewelry, the DREAM earrings were carefully designed and handmade by Catherine of Shadow Dog Designs. 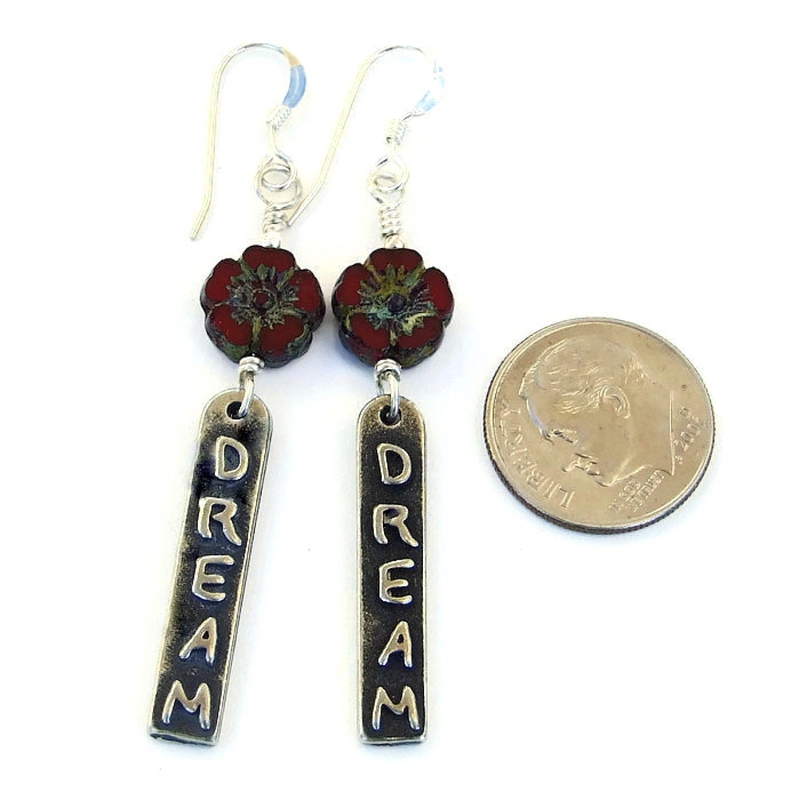 *** For a better understanding of the relative size of the inspirational DREAM earrings, please be sure to check out photo # 6 for a size comparison with a dime. The lightweight dream charms were was made in the U.S. from high quality, lead free pewter with a rounded, long rectangular shape. The polished letters are raised and are eye catching against the darker oxidized background. 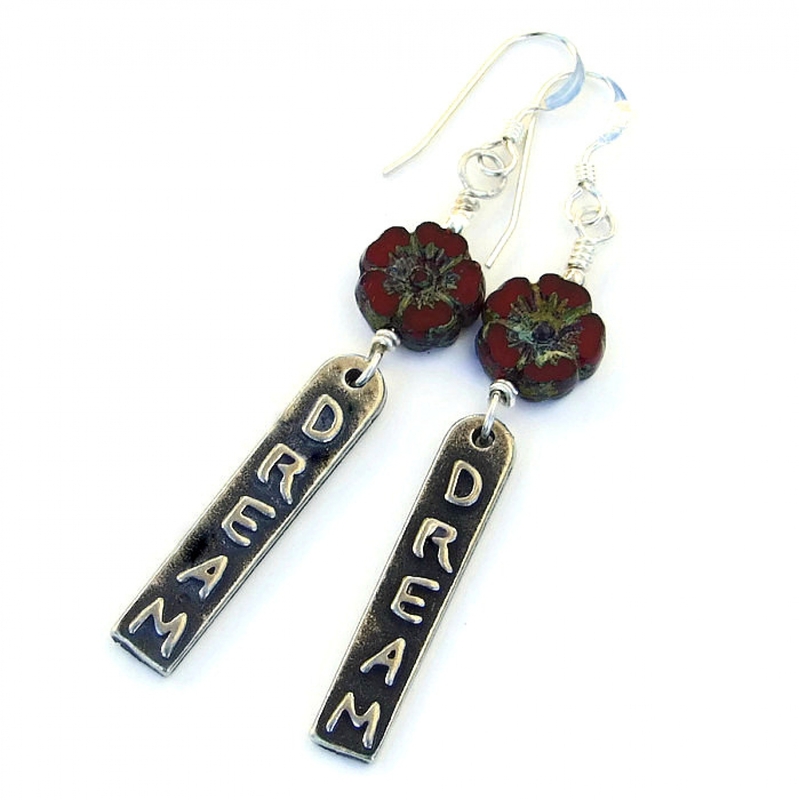 The backside of the dream dangle charms is flat and both sides have a rustic, brushed finish. 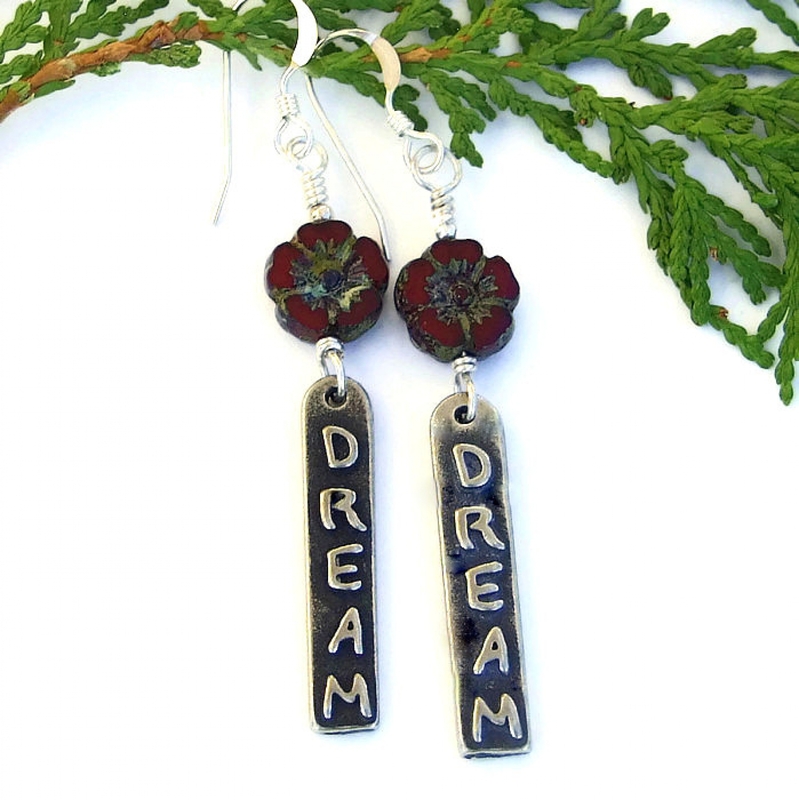 To add a whimsical touch to the earrings design, rich red Czech glass flower beads were wire wrapped above the dream charms (maybe dreaming of flowers?). As you can see, the two-sided flower beads have great detailing, highlighted even more by the light gray and lichen green Picasso finish that settled into the recessed center of each flower. A 2 mm ss bead caps each flower. All of the elements used to make the DREAM earrings were wire wrapped on sterling wire and connected to sterling silver French hook earwires. Pewter is believed to be very grounding, bringing the wearer back to reality. Through the centuries, flowers have been a symbol of spiritual awakening; also they have been symbols of generosity and love when given away. Even though man made, glass carries the energies of transformation, rebirth and communication. Silver is a metal of love and healing; it is a mirror to the soul, helping us to see ourselves as others see us. The DREAM artisan earrings were carefully designed and handmade in a dog friendly, smoke free studio. They will be carefully packed in an organza jewelry bag with tissue, perfect for gift giving to a loved one . . . or to yourself!